Kuboušek is today a well-known name in the plastics industry. Ing. Ivan Kuboušek founded his firm shortly after the Velvet Revolution – in July 1990 – with minimal capital and very limited premises in České Budějovice. Currently it is one of the key players on the market in both the Czech Republic and Slovakia. Now the KUBOUŠEK Group includes 7 companies with almost 150 employees. This year it celebrates 25 years from its foundation, which undoubtedly is a weighty reason to remember how it has gained its position. At present the portfolio of the firm is very wide; the company sells and maintains measuring equipment, injection moulding machines, robots, temperature control units and instruments, material conveying and processing equipment, belt conveyors, cooling systems, mills and granulators and other equipment used in the production of plastic materials. 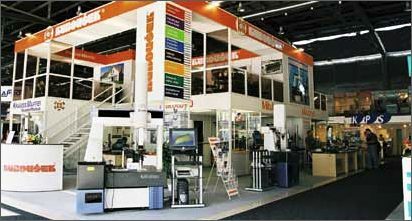 In the Czech Republic and Slovak Republic, KUBOUŠEK is an exclusive dealer for more than 10 firms, mostly from Germany, but also from France, Switzerland, the Netherlands and Japan. 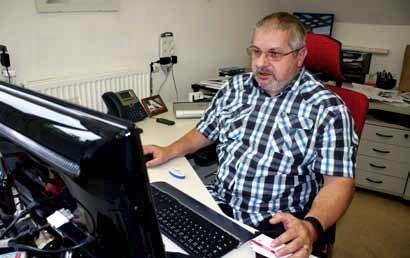 Ivan Kuboušek founded the company as a family business in July 1990 with the goal of importing and selling top quality measuring instruments from the Japanese company Mitutoyo. However that was only the beginning. “One year later, in 1991, I established the plastics department in my company. In autumn of that year we also took part in the International Engineering Fair in Brno for the first time. As far as I know, we were the first private exhibitor there,” says Ivan Kuboušek. In the same year the company turnover reached CZK 20 million. This success was an impulse for Ivan Kuboušek to further extend the activities of the company. Thus in 1992 the company entered into leasing services and began to create a structure of dealerships of companies manufacturing plastic processing machines and their peripheral devices. Another milestone in the company history was the year 1995 when KUBOUŠEK terminated representation of Ewikon, the hot runner specialist (it had lasted since 1993, and was renewed in 2010), but managed to conclude exclusive dealership agreements for the territories of the Czech Republic and Slovakia with Rapid, Sepro, and above all with KraussMaffei. The latter is the oldest manufacturer of plastics and rubber processing machines – it was founded in 1926. 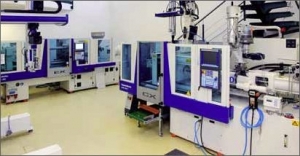 The company develops and manufactures machines for three main methods of plastics processing – injection moulding, extrusion, and production of thermosets. The starts however were not easy. “KraussMaffei machines were the most expensive compared to their competitors on the market. It took almost 10 years to increase their sales in this country. We however managed to put through this brand, its quality and technological advantage, and today, apart from Germany, the Czech and Slovak markets are the 4th and 5th in the world for KraussMaffei,” continues Ivan Kuboušek. This Munich company is the strongest in plastics production in the automotive industry, but also has a strong position in the packaging industry and electronics industry, and also in the production of medical devices. Today it is a matter of course to offer the customer automation of the entire manufacturing cell, which contributes to the strengthening of the position of KraussMaffei as the supplier of complete technological sets. In the Czech Republic, KraussMaffei can pride itself on a unique share of big machines. KUBOUŠEK Group continues to improve collaboration with KraussMaffei Group, and, among other things, directly with the KraussMaffei production plant in Sučany, Slovakia. “On 7 July 2015, in Sučany we co-organized already the third Open Day for all Czech and Slovak customers,” invites Ivan Kuboušek the readers of Technický Týdeník (Technical Weekly Magazine). In the plastics industry, KUBOUŠEK also represents KOCH Technik, Sesotec, Regloplas, ONI, EAS, and MTF Technik on the Czech market. 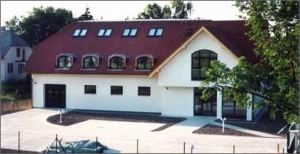 To support the sales, in 1999 the company built a new commercial and training centre for more than CZK 30 million. At the beginning of 2015 KUBOUŠEK Europe s. r. o. was transformed into KUBOUŠEK Systems s. r. o. In KUBOUŠEK GROUP it is a hi-tech company making the best of ample experience with plastics production which before had been provided by KUBOUŠEK s. r. o. (today the strongest of the subsidiary companies). It is a technical guarantor of the complete supply of process equipment, and provides application development and testing capacities to customers who have not their own capacities.Last year KUBOUŠEK Europe s. r. o. was established; it has taken over all activities of the original firm Ing. Ivan Kuboušek, and at the same time it has absorbed the basic support centres from KUBOUŠEK s. r. o.; Ivan Kuboušek has become 100% owner and executive head of all companies of the KUBOUŠEK Group. “This legal form was selected to enable activities of the company not only in the Czech Republic, but also in other countries where it is planned to establish companies of the same legal form under the KUBOUŠEK name and thus to create a KUBOUŠEK GROUP corporation,” continues Ivan Kuboušek. Since 2015 the company has had a subsidiary also in Poland. At the beginning of 2015 KUBOUŠEK Europe s. r. o. was transformed into KUBOUŠEK Systems s. r. o. In KUBOUŠEK GROUP it is a hi-tech company making the best of ample experience with plastics production which before had been provided by KUBOUŠEK s. r. o. (today the strongest of the subsidiary companies). It is a technical guarantor of the complete supply of process equipment, and provides application development and testing capacities to customers who have not their own capacities. However the transformation does not end with this. At the beginning of this year Ivan Kuboušek founded the joint stock company KUBOUŠEK EU holding a. s., which is the controlling, servicing and analytical organization for all the other firms in the Group. Beside practical and methodological control of the Group, the functions of the company include activities of central sections (financial, technical, marketing and human resources) for all firms in KUBOUŠEK GROUP. After completion of the reorganization project of the Group during this year, KUBOUŠEK EU holding a. s. will be the parent company of all limited liability companies (s. r. o.) in the Group. “Now my visions which I have conceived for a long time, are finally beginning to come true,” smiles Ivan Kuboušek, and adds: “A lot of changes I had to obtain by defiance. That is to say sometimes it was extremely difficult to convince my colleagues and especially my family of their feasibility. But I always said: Show me one project that cannot be realized. So far we have not had any, although some of them are very successful and others are not so successful.” Kuboušek’s visions that have come true include the Technology Centre opened in 2010. Also his own development centre should start its operation soon. Ivan Kuboušek also plans to further develop the training activities of the firm: “I expect that in one to three years we will build a separate training facility. We have comprehensive know-how, extensive practice, and thus we are able to use them in pedagogical practice. However, even today the offer of our training centre is very varied. For over 15 years we have been providing training in the control, programming and maintenance of KraussMaffei machines and robots, Sepro robots and some peripheral devices, and, on a large scale, of the Mitutoyo coordinate measuring machines and laboratory instruments,” itemizes Ivan Kuboušek. After the 2009 crisis, the goal was in ten years to start intensive investment and restructuring activities in order to reach a turnover of CZK one billion. At present the turnover of the entire Group is approaching this value. “The KraussMaffei division is the main contributor to this amount, while even the smallest divisions exceed a turnover of CZK 100 million. Here we speak only about the sales realized by our Group. If we take into account also the sales through direct distribution channels, from which we, as the exclusive dealer, have also commissions and provide guarantees, then the sales of goods have already exceeded one thousand million Czech crowns for several years,” explains Ivan Kuboušek. In a nutshell: the important advantage of KUBOUŠEK is that thanks to its wide portfolio of services it is able to design optimal configurations of machines and their peripheral devices – from silos, drying, dosing, colouring through the machine configuration itself up to everything that is downstream of the machine i.e. crushers, robots, conveyors, cages, separators of good and bad parts. Automation is a big topic today. KUBOUŠEK is strong in this field as well; it offers its customers the design and supply of automated workplaces, the manufacture of grippers for KraussMaffei and Sepro linear and six-axis robots, and the design and supply of protective cages and conveyors.